The Department of Energy (DOE) lists six energy sources as renewable: Wind, Solar, Hydro, Wood, Waste, and Geothermal. Solar represents the combined output of photovoltaic (PV) and concentrated-solar (CSP) power plants. The generation obtained from the six sources during the last decades is illustrated in the two graphs below: Wind and Solar (W&S) in the left one, and all the others, Hydro, Wood, Waste, and Geothermal (non wind/solar renewables) in the right one. The scales are the same in both graphs. A quick glance at the graphs reveals the upward trends in the W&S chart, and the near horizontal, no-growth lines in the non wind/solar chart. The following paragraphs discuss the up-to date performance of these energy sources and evaluate the likelihood of them exclusively powering our society’s needs in the future. Wind has been adding about 3 GW each year recently, solar 2 GW. The growths have been linear recently which makes it easy to predict that wind would reach about 300 GW and solar 200 GW in a century. The illustrated 39 GW combined output in 2018 represents 8% of the US electricity consumption of 476 GW. Should that linear trend continue, almost a century would pass before W&S output would reach the desired 100% renewable electricity goal. It will be longer yet if the upcoming wide adoption of electric vehicles becomes a reality. As for covering the overall U.S. energy consumption of 3300 GW, it would take over a half a millennium for the W&S output to reach that level. These centuries-long projections for the W&S would, of course, be realistic only if some large-scale storage technology existed, one that was also relatively low-cost, inasmuch as W&S electricity alone is already many times costlier than that produced in traditional plants of today. As an example, a 1970s nuclear plant operates at 2.4 $/W, the dollars adjusted for inflation and the wattage reflecting the actual power delivered over four decades. In comparison, an off-shore wind farm averaged 21.0 $/W over two decades, at about ten times higher cost, all conditions the same. The nuclear plant is still running in its fifth decade. The wind turbines are being dismantled after the usual two decades. This ten times higher cost of energy production has not impacted customers as yet thanks to the plethora of subsidies and incentives. The above projections are based on the raw DOE numbers. Now, the question is are they reflecting the real world? Those numbers do show the output from the renewable plants to the grid but omit to subtract the energy those plants draw from the grid and from fossil fuels. This external input is needed daily and nightly, and during repairs and maintenance, at unexpected shutdowns, and similar. On sites with below average producing up to one tenth of the power output is drawn from those external energy sources. As an example, a central station solar (concentrated) facility in the Mojave desert drew about 9% of its output from the grid and from burning natural gas, diesel fuel, propane, and the like. Such draw is rare with nuclear and other thermal plants and insignificant on the scale of the incomparably higher output per site. Adjusted accordingly, the net DOE numbers would be several percent lower than the two preceding graphs show. How much depends on the productivity of each site individually as they all differ. This downwards adjustment is expressed as the Site Factor (SF). It is a ratio akin to the capacity factor (CF), but whereas CF is the ratio of the plant’s actual output averaged over the life of the plant to the name plate power rating, SF is the ratio of the plant input energy from all external source to the net output of the site in its life. Adjusted for the SF, the graphed curves would be a few percent lower and the number of years needed to reach the goal of 100% energy from renewable sources higher. Therefore it seems rather unlikely that we will be able to achieve the 100% renewable energy to power our society in ten years or in any length of time. Millions of new W&S plants would be needed and each replaced four or five times a century. The size of the needed personnel would be staggering. The W&S industry claims employment slightly more than either the gas or coal extraction (mining) industry at about 250,000 jobs. The relative productivity per employee is 7.5 kW for solar; 32 kW for wind; 1300 kW for fossil fuels; and 2000 kW for nuclear. Based on these numbers, the presently available total work-force will be insufficient to manufacture, operate, maintain, tear down, dispose of, and erect all those millions of W&S plants that would be needed anew every 20 years. All of us would work for the W&S industry, its operators, suppliers, contractors, maintenance, line crews, etc. And we should recognize that jobs are a labor cost that raises the cost to customers. Employing robots instead, as one “solution,” implies more energy needed which requires more W&S plants to produce it, which requires more …… (you got it). 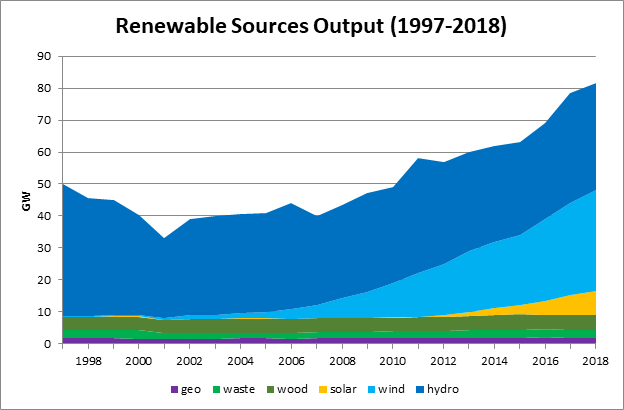 As is apparent from the preceding non-wind/solar renewables graph, the near-horizontal trend lines of those four sources attest to the lack of an appreciable growth and, aside from hydropower, the negligible contribution. There has been no worthwhile upward trend in W&W&G in the two decades, yielding on the average 9.1 GW combined, while hydro registered its usual ups and downs, ending at 33 GW this year. The combined yield of all four sources is not any higher today than it was two decades ago, actually it is slightly less. Increasing hydro’s yield would require either more rain or reduced irrigation. (Dams sometimes serve both power and irrigation purposes). The rain is beyond our control. Regarding irrigation, are we willing to cut down on domestic-grown veggies? Some propose to build more dams, or equip current irrigation and flood control dams with turbine-generators. The trouble here is that too few sites are suitable for the damming, and some of those could not be built because of environmental concerns anyway. The retrofitting offers too low a return on investments, if any. Which is the same reason why engineers in that past did not equip those dams with generators when it would have been much cheaper. And that was at times when electricity was more expensive and environmental restrictions fewer than today. The builders undoubtedly considered also silting, the ultimate death of all dams, and a rather quick one with the small ones. The three remaining “Other” sources, wood, waste and geothermal provide steady supply from year to year, unlike the wiggling hydro, but it is minuscule in comparison. Besides, although wood and waste are renewable sources they cannot be classified as clean: their burning emits CO2 as well as “real” pollutants such as those that one can smell. Thus the legitimate, clean, sources in the “Other” category are just two: hydro and geothermal; they yielded 33+6=39 GW in 2018. That output inevitably will continue averaging at the same level for the foreseeable future. Therefore, to achieve the 100% clean energy goal, W&S would have to be producing an additional 476-39=437 GW. The future demand, however, is likely to be higher considering population growth and ongoing industrialization. Should electric cars become ubiquitous they alone would be consuming another 110 GW, increasing the total to 547 GW. With the earlier illustrated annual gain it would take over a century to reach that 100 % goal. While that many times greater than present output may be theoretically possible, the high cost of W&S electricity over the current one would have dire consequences for the US, to what purpose? 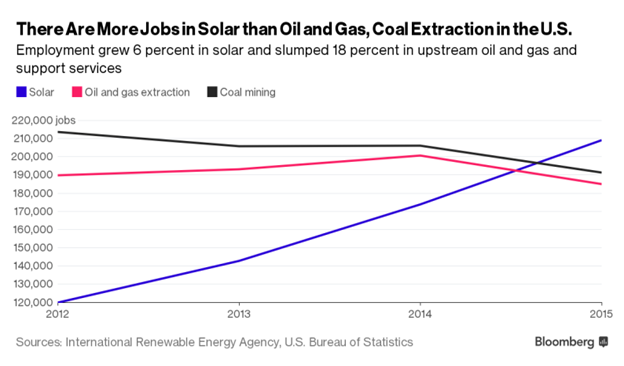 The next and last graph illustrates the two-decade history of the renewable sources output in this country. It shows the steady output of the wood, waste and geothermal group, and illustrates how small each of them is on the scale of the three big ones. Interestingly, the hydro output is lower today than it was two decades ago, and it is now matching the present wind output. The growth of the whole group over those two decades is shown amounting to between 32 GW and 50 GW depending on which year is selected as the starting point. of several sources, and the total would be several percent lower. About $3 trillion has been spent on the renewable energy effort since 2004, and the figure has now stabilized at about $300 billion for each one of the last six years. The return on that investment is illustrated in the preceding graph showing the pitiful gain in the twenty years history. For a comparison, the earlier mentioned nuclear power plant – another source of clean and green electricity and also heat – cost $4 million, inflation adjusted. Not billions, just millions. Thousands of them could have been producing power for the money spent on renewables to-day, making our country and the world cleaner and richer as a result. As to the likelihood of the W&S output influencing climate change, those 17% of electricity, 1% of total U.S. energy consumption, are unlikely to do it, nor is it possible to measure and determine such causes and effects reliably as yet. Furthermore, the net percentages are lower as the manufacture, maintenance and disposal of the W&S plants all consume electricity and also fossil fuels, in addition to the mentioned consumption that both require during no-wind and no-sun periods. That, despite seeing those goals not met and budgets going red repeatedly. And some of the proponents claim that to mean the US energy overall not just electrical, the latter being a fraction of the overall. *A note on the units in the DOE annual statistics: Those pages list different units for different kind of energy and power thus making comparisons cumbersome and prone to errors. Unified in this report on just one unit, the watt makes comparison instant and less prone to mistakes. For information, 1 GW = 8770 million kilowatt-hours/year and 30 quadrillion Btu/year. The “per year” is implied in the tables, but not stated. This omission in the headings is one reason why there is confusion in converting power and energy numbers. Where just one unit, the watt, should suffice, there is also joule, calorie, Btu, …., and any of them per second, hour, day, or year. The post US Renewable Statistics: Real vs. Potential Output appeared first on Master Resource.